There comes a time in many of our lives when marriage is on the horizon. You already hear wedding bells, you are thinking about the home you will be living in, and the excitement of starting a new family is a dream come true. But before we walk down that aisle, it is wise to take a few days to celebrate the ending of your singleness. Because if not, it is left unsettled and may creep up on you later in life when you least suspect it. A wedding and a marriage can sometimes be overwhelming, so taking time to breathe before you make one of the biggest moves in your life is pretty much mandatory. Now some ladies like to stay around their hometown and celebrate their bachelorette party, while others want to travel to another city. Some of my friends have recently been to Savannah GA and Charleston SC for their celebrations. They rented out a house on AirBNB, planned out the eateries, breweries, and nightlife they wanted to experience, and off they went. 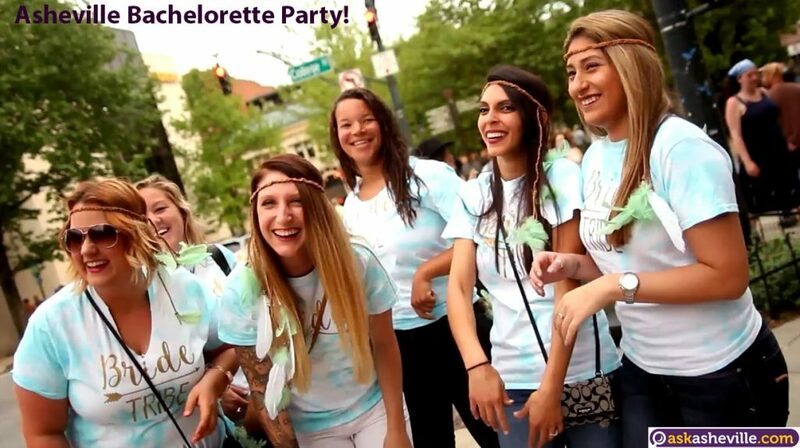 Now Asheville is a big bachelorette party destination so here is a quick guide to help you pick some great places when you are in town. Where you will stay is very important as negative lodging experiences can ruin the whole trip. Yes, maybe you are going to be out and about and not spend that much time in the room, but when you do come back for even a little cat nap, you want to be clean, comfortable, secure, and well taken care of. The Hotel Indigo is always a great spot, as well as the Omni Grove Park, the Inn at Biltmore and the Grand Bohemian Hotel. Places to eat are many in Asheville North Carolina, so you will not go hungry. Places like Fig Bistro, Curate, Junction, The Admiral, and many others offer fine meals and a great time. You can also check out the breweries-eateries that serve both craft brews and good food. Or maybe you want an amazing meal catered by a personal chef to your room or house rental? In that case, make sure you meet Chef Katie! Wine may be in your plans and Asheville has several great spots for that. Visiting the winery at The Biltmore is a fine experience to have. Then downtown has several locations such as 5 Walnut Wine Bar, Sante, and Battery Park Book Exchange which are all great. The breweries in Asheville are a big part of our community. And it is not just the beer, but the craft and experience. Check out this tour map of 10 Asheville Breweries that you could check out when you are in town. Also Pour Taproom in west Asheville has a bunch of beer taps and it is self-serve, so you can spend an hour or two sampling craft brews. Asheville has lots of sweets to go around, and it was recently National Dessert Day, so here is a blog post full of desserts stops in the area, each with their own little twist. Coffee is big here in Asheville North Carolina, and you will surely fall in love with many of our little coffee shops around town. Here is a blog post about 24 Places To Get Coffee In Asheville. We have several great places to have cocktails in Asheville NC on the AskAsheville Cocktails Page. But there are several other spots in the area such as Post 70 on the east side of town, plus Sovereign Remedies, Limones, and Posana downtown, that you need to check out. Nightlife is an essential for bachelorette parties, and Asheville has lots to do. 5 Walnut Wine Bar is pretty much a sure shot when it comes to music, wine and beer. It is usually packed, but worth the wait to get in. The same goes for Nightbell, another must-visit spot. Then there are plenty of music venues such The Orange Peel and Asheville Music Hall downtown, Isis Music Hall in west Asheville, and Grey Eagle in the River Arts District. There are several tours you may want to take around town. LaZoom Comedy Tours offers a blend of Asheville history, humor, and plus you can bring your own bottles and drink away during the whole tour. The Amazing Pubcycle allows you to pedal around town, singing and dancing. Asheville Premier Transportation offers private brewery, restaurant, wine, and scenic tours for groups, and they are fantastic! And don’t forget to tour the famed Biltmore Estate to see the house, winery, and their beautiful property. You can also check out AskAsheville on Facebook to see lots of other experiences that folks have written about. 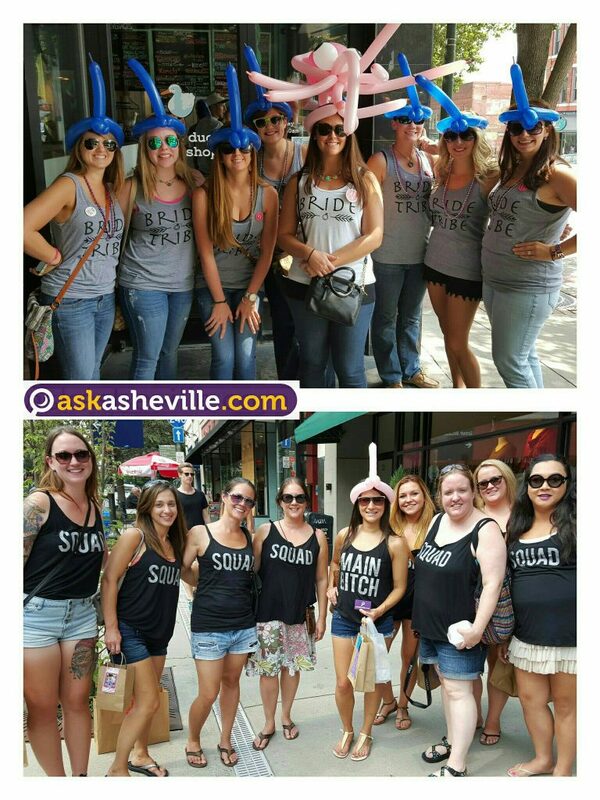 If you want to write about your Asheville Bachelorette Party experience, please see our Blog Posting Page. And if you have any questions about the Asheville North Carolina area, ask them on the AskAsheville Question Form.